The most successful IT implementations are built on a close working partnership between supplier and client and a pooling of ideas and knowledge to produce effective solutions which evolve as either partner identifies new opportunities. Musgrave Ltd – Ireland’s largest food and grocery distributor has benefited from just such a relationship since it selected BCP as system supplier for its Cash & Carry Division in the 1990’s. Musgrave pioneered cash and carry in Ireland, opening its first outlet in 1961. 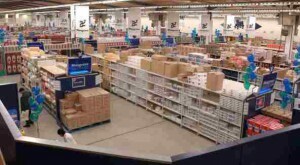 Since then the division now Musgrave Wholesale Services Division (MWS) has expanded enormously. It now provides Delivered Retail, Delivered Foodservice and Cash & Carry services, boasting 10 depots, 34,000 customers and turnover exceeding 500m. Musgrave’s initial 2.4m investment encompassed BCP’s entire Accord Distribution System – tailored to Musgrave’s particular requirements – to control both cash & carry and delivered activities. It quickly delivered benefits to Musgrave’s bottom line. Peter Slevin, IT Projects Manager at Musgrave, explains: rapidly became clear that Accord was going to help us maintain and develop the competitive advantage of both the company and our customers. Profit margins quickly improved, alongside significant reductions in stockholding, better purchasing and improved customer service. Proactive Telesales greatly improved our Delivered Telesales operation, producing measurable increases in sales. Since the original implementation, BCP have worked closely with Musgrave, developing Accord in line with changing market and business needs, as the company has grown. The partnership works well, both IT and operations staff from Musgrave collaborating with BCP on developments. Slevin explains: This way we can be certain we consider all aspects of new developments and be sure that when we put them into practice they will function properly. Early developments focussed on promotional and loyalty features to enable Musgrave to operate better schemes for developing customer loyalty and sales. The loyalty module is now the basis for all Musgrave loyalty promotions, providing effective monitoring and powerful statistics for marketing and planning. Slevin explains: The Accord loyalty system saves us 000s in administration costs, generates enormous customer goodwill and masses of useful information for marketing. During restructuring of MWS in 2002, BCP worked closely with Musgrave, tailoring Accord to ensure operations continued to run smoothly following the changes. Fine tuning of stock management functions, for instance, was critical to the efficient management and allocation of stock as the depots refocused their activities. Restructuring began with the opening of a purpose-built, stand-alone Food Services depot at Ballymun, the Accord Food Services solution being implemented to control all aspects of warehouse activity and management. Incorporating RF features for the first time, the system allowed staff to work faster and smarter with real-time information, quickly delivering substantial productivity, accuracy and cost savings benefits. Keen to extend these benefits to other operations, Musgrave worked with BCP to develop RF features for improving front-of-store’ cash & carry activities. Innovative RF modules for key selling face activities, including Gap Replenishment, Price Verification and Shelf Edge Label production, were quickly developed and rolled out to all cash & carry depots. Improvements were substantial: Shelf prices are always up to date, labels accurate and in place and low or empty shelves or warehouse locations are promptly restocked. Lost sales, as a result of product unavailability, are minimised. Many tasks can now be undertaken simultaneously, delivering recognisable business efficiencies, while selling face activities are completed much faster, freeing up staff for other value-add tasks. More recently RF has been introduced for Goods Receiving, delivering labour saving benefits as well as improved accuracy and control over this area. The introduction of RF has advanced Musgrave from a technological and operational point of view, leaving it well poised to take advantage of further opportunities. Musgrave is keen to exploit this investment and is also considering combining it with other new technologies, such as Voice Recognition, to attain even greater efficiencies. Committed to becoming the number one foodservice supplier in Ireland, MWS recently acquired specialist frozen food foodservice operations C & R Foods and Variety Foods and is implementing Accord, with powerful new Telesales features, across all acquired depots. This follows a recommitment to BCP as systems supplier which concludes a comprehensive systems review and recognises the success of the partnership. Slevin concludes: Working together, over a number of years, has resulted in a strong partnership which has played an important role in Musgrave’s success. We are confident that BCP understand our business and needs and that working together in the future will ensure we continue to provide a world class, cost effective service to our customers and grow our business successful.